I’m a fan of lens caps over built-in lens covers on my cameras, mostly because 1) they never get stuck shut and 2) I can wander with my camera around my neck ready to shoot, and I don’t have to worry about whether the cap is on or not. However, I have also lost and broken way more caps than I’d like to admit, and the safest place – my pocket – adds lint which inevitably ends up on the lens. What to do? 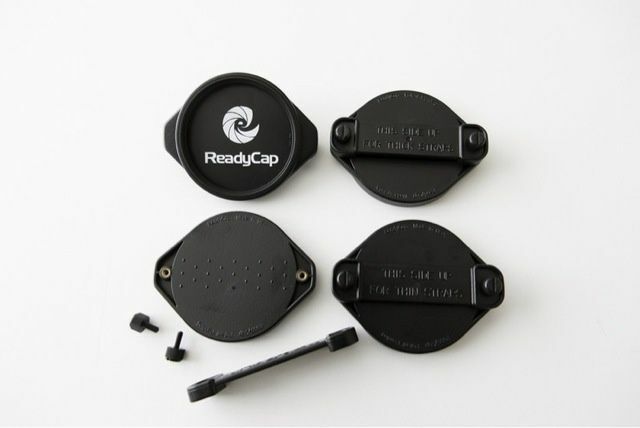 I might try the ReadyCap, a handy spot to keep pretty much any cap you have. The ReadyCap is ridiculously flexible. The tough ABS base hooks over your camera strap with a screw-fixed bar, and then sits ready to receive your lens-mounted accessories. It will accept any pinch-mount lens cap, and further adapters change its size to fit any cap you have. What’s more, the internal surface is threaded so you can even use it to keep filters screwed safely out of the way, with your lens cap stacked on top. This is a great way to carry a polarizer or a neutral-density filter – the only filters you need for a digital camera.